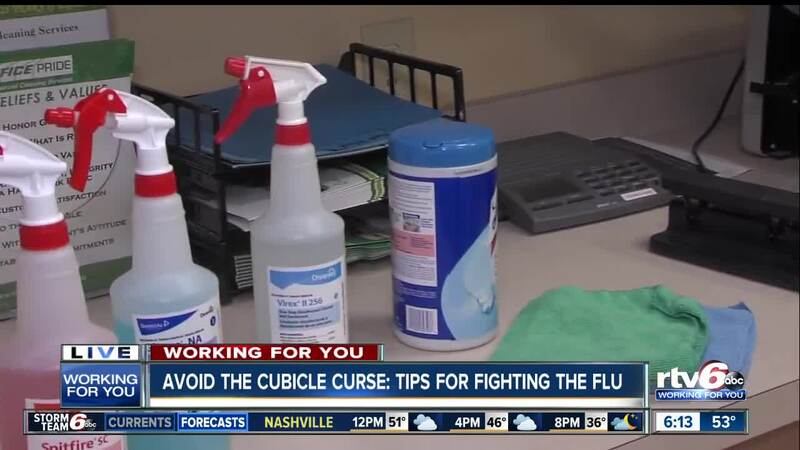 With the flu season now officially underway, doctors are urging everyone to get their flu shot, but the vaccine isn't foolproof, so you'll need to take extra steps to avoid catching whatever might be floating around the office. INDIANAPOLIS — Flu season is here and if you haven't had one yet, you should get a flu shot. But there are extra measures you should take to keep the germs away — especially at the office. Cleaning experts say to clean your keyboards, phones, desk and any accessories you use with disinfectant wipes at least once a day. You should also have someone designated to wipe down communal items, like the copier and coffee pot, to kill any germs an the surfaces. "You always risk touching something then touching your eyes or your nose or your mouth," said Scott Gipson, owner of Office Pride of Indianapolis. "It's very important to be diligent and to make sure that your disinfecting as much as you can during the day. You're washing your hands with soap and water, and when soap and water isn't an option, then hand sanitizer is a great second option." Gipson also says it's a good idea to hire a professional company to deep clean the office to find any spots you may have missed during the day.